WASHINGTON (CNN) -- Former President Bill Clinton's international business dealings, global foundation and penchant for going off script could present a significant obstacle to Hillary Clinton becoming secretary of state, observers say. 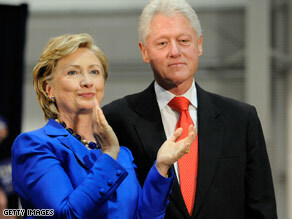 Bill Clinton's extensive global ties could cause conflict if Hillary Clinton is appointed as secretary of state. On the one hand, his established relationships with world leaders could instantly make the New York senator a welcome face in embassies around the world. On the other, his complicated global business interests could present future conflicts of interest that result in unneeded headaches for the incoming commander-in-chief. Two officials with President-elect Barack Obama's transition team confirm to CNN that it is investigating Bill Clinton's finances and post-presidential dealings. As part of the early vetting process, the team is looking for any negative information that could throw the prospect of Hillary Clinton as secretary of state into jeopardy. A particular issue could be the donor list of Bill Clinton's global foundation, which might show connections to international figures who push policies that might conflict with those of the new Obama administration. Obama last week asked Clinton if she would consider being his secretary of state, multiple sources told CNN. Clinton's response is expected this week. iReport.com: Who should be in Obama's Cabinet? Since exiting the Oval Office eight years ago, Clinton has reportedly raised more than $500 million for the foundation, a significant portion of which financed the construction of his presidential library. The foundation has also doled out millions for AIDS relief in Africa and other charitable causes around the world. Amid repeated criticism from Sen. Clinton's primary opponents, Bill Clinton would not reveal the extent of the foundation's donor list earlier this year. But The New York Times has reported the list includes some foreign governments, including members of the Saudi royal family, the king of Morocco, a fund connected to the United Arab Emirates, and the governments of Kuwait and Qatar. The former president has also reportedly solicited funds from international business figures connected to human rights abuses that his wife has outwardly criticized, including the governments of Kazakhstan and China. During the New York senator's White House bid, critics repeatedly said that foreign governments and business executives could try to exert influence through donations to the foundation, prompting a pledge from the former president to publicly disclose all future donors. Observers say the same criticism is likely to be raised should Hillary Clinton become secretary of state, especially if countries she is dealing with on the diplomatic stage have at the same time donated heavily to her husband. The matter could be complicated even further if it remains unclear exactly which foreign governments are supporting Clinton's foundation and to what extent. On Monday, Politico reported that Obama's team is seeking more information about the former president's finances and is growing frustrated over the Clinton camp's response. The Obama officials disputed the Politico report, but confirmed the transition team is seeking unspecified records from the former president to get a better handle on issues related to his foundation work and presidential library to try to deal with potential conflicts of interest. Also at issue is the former president's role in general should his wife become secretary of state. Since leaving office, Bill Clinton has become a globetrotter of sorts, amassing millions in speaking fees as he gives talks before corporations around the world. The Obama administration would probably seek to curtail that practice amid worries that the former president's words could contradict those of his wife at times and make unclear to some just who is speaking for the United States government. But it's unlikely that Clinton, who has always enjoyed the spotlight, would be willing to retreat from the public eye. "She really has to sit down with her husband and work through where does this leave him," said David Gergen, a senior political analyst for CNN who worked in Clinton's White House. "After all, he's very deeply involved in the Clinton Global Initiative, doing good around the world. Could he continue to do that? Would he have to shut it down? Could he take money from people? There are lots of secondary questions." Even more problematic could be the former president's history of going decidedly off message during speeches and his willingness to blatantly speak his mind seemingly without regard for the political fallout. During her presidential bid last year, Sen. Clinton at times publicly criticized her husband for things he said on the campaign trail, and in one particularly embarrassing moment for the campaign, she told him to "knock it off." But ultimately, the duty of keeping the former president in check may fall to the New York senator should she assume the top diplomatic post. "If he doesn't stay on script, she's going to have to discipline him, just like she did in the campaign," said Gloria Borger, a CNN senior political analyst. "It won't be up to Obama, it will be up to her."